Purity is essential in all the stages of production and processing of pharmaceutical products. Calgon Carbon’s suite of products can be used for purifying a variety of pharmaceutical product, as well as isolating or concentrating a variety of pharmaceutical intermediates. Additionally, wastewater is often treated with activated carbon to remove residual organics before being discharged to national surface waterways. In order to remove trace impurities, incoming process water is commonly treated with activated carbon. Calgon Carbon has specifically developed a range of activated carbons with porous structures adapted to your requirements for the pharmaceutical and fine chemical industry. These ultra-pure grades improve the productivity of your purification stages without risking the contamination of finished products. We are offering our Pharma Kits to companies that have an interest in our product line and would like to conduct testing. 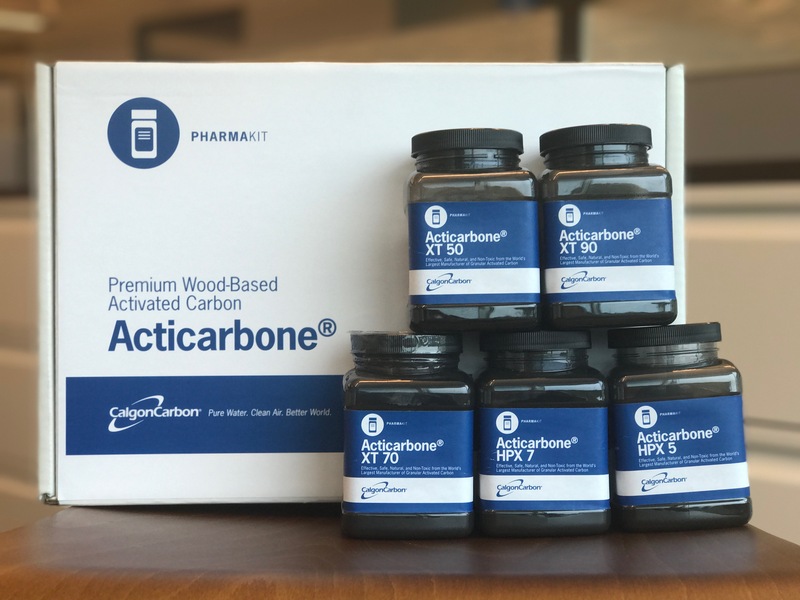 Outstanding performance with Acticarbone® range, manufactured from renewable marine pine wood. Efficiency of your purification process. Improved recovery of APIs through increased yield. Waste reduction thanks to optimisation of consumption. On both chemically and steam activated carbons. Ultra pure range with very low ash content. Specific grades for pharmaceutical applications. Guaranteed highest quality and traceability. Sustainable and renewable raw material. High stability of chemical and physical characteristics. Calgon Carbon has developed granular and powdered activated carbon products that are designed for optimum removal of color and odor compounds, proteins, and other contaminants that could be present in the raw materials, or that form during production. Calgon Carbon's continuous ISEP®/CSEP® systems are commonly used for antibiotic purification, vitamin recovery, optical isomer fractionation and pharmaceutical intermediate processing. Because of the versatility and flexibility of the ISEP®/CSEP® technology, Calgon Carbon can cost-effectively provide a design that is optimized for a wide variety of processes. CCC can bundle the performance advantages of activated carbon with equipment (service or purchase) and related services, to provide a full turnkey solution to decaffeination.